I've mentioned in the past that I have a solid family history of heart disease. That knowledge always guides my food choices in terms of fat and cholesterol, but I've recently vowed to also keep a closer eye on the sodium I'm consuming. I'm determined to keep my family healthy, too, so I'm also watching their sodium intake! Since January, I've been working to replace the salt in our diets with flavorful herbs and spices. One easy and delicious way to do that it to add in some Mrs. Dash seasoning and skip the salt altogether! There are some super-fun blends to try, including Tomato, Basil & Garlic and Caribbean Citrus, but sometimes Mrs. Dash's Original Blend is all we need to add flavor without sodium. I had purchased some asparagus last week with the intention of serving it for a breakfast-at-dinner meal over the previous weekend. That didn't pan out as I had planned, and I had asparagus that was starting to wilt in my crisper drawer. My usual method of cooking aspargus involves steaming it, then sprinkling it with sea salt, but I wanted to try Mrs. Dash on it instead. Wash and dry the asparagus. If it's starting to get soft and wilty, just plunge it into ice water for about 5 minutes to perk it back up again. Pat it dry. Grasp the asparagus at the base and about halfway up the stalk and snap off the woody ends. Discard the ends. Toss the remaining stalks into a baking dish (mine is a weird 7×11 size, but you can use 8×8 or 9×13). 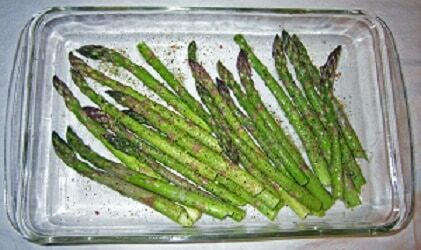 Drizzle asparagus with olive oil, then toss the stalks around in the dish to get each one fully coated. Roast in the oven for 10-12 minutes, until hot to the touch. Serve and eat. Honestly, this is one of the best ways I've eaten asparagus. I didn't even miss the salt! Plus, eating asparagus in-season always reminds this Minnesota mom blogger that spring is right around the corner. The bright green color and the tender-crisp texture tends to lighten my mood and remind me that warmer days are ahead! If you want a heart-healthy way to serve asparagus or other vegetables, try sprinkling on a little Mrs. Dash!